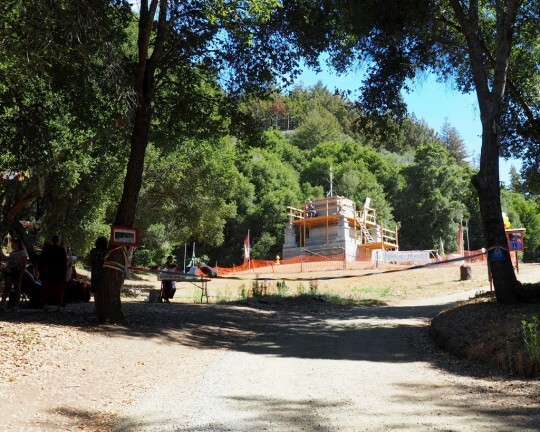 The finish line and the Mahabodhi Stupa being built at Land of Medicine Buddha, California, US, August 2015. Photos courtesy of Mer Stafford. My name is Mia Blue Stafford and I am 11 years old. One day, I was running with my mom at Land of Medicine Buddha and we were marveling over the beauty of the forest and how amazing it will be when the new stupa is finished. My mom was telling me how people could make offerings to help pay for the stupa. That made me start thinking about how I could help. After giving it some thought, I had an idea! 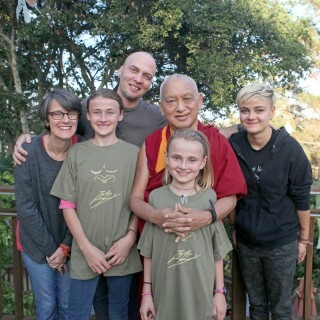 Lama Zopa Rinpoche with the Stafford family (from left) Mer, Mia, Troy, Maude and Maddy, California, October 2015. Photo by Ven. Lobsang Sherab. On Medicine Buddha Festival day in June, I had a Miles of Merit stall. Many generous people offered money and encouragement. 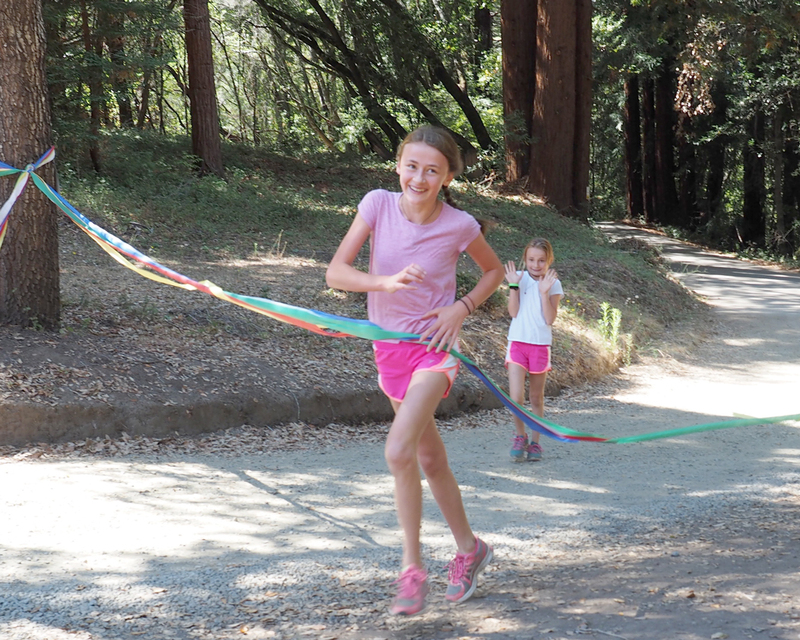 One person offered US$108 in one-dollar bills to fully sponsor one lap of the run. She wanted me to see exactly what US$108 looked like. My friend from school helped me tell people about the run and we had a good time. It was actually super fun talking to all the people and experiencing people’s enthusiasm and interest for the project. From that day forward, I felt so happy when I was running and thinking that I could actually help make a difference. I was excited because I wanted to help build the stupa because it will be beneficial to all sentient beings. As people heard about the project, they would ask me why I was doing the run. I had a hard time explaining why at times – it just felt like the right thing to do and I love running. It could be that I grew up going to different Dharma centers, helping work on different stupas. I love hearing Lama Zopa Rinpoche speak of the benefits of stupas and how much they can benefit people and animals, even tiny insects! 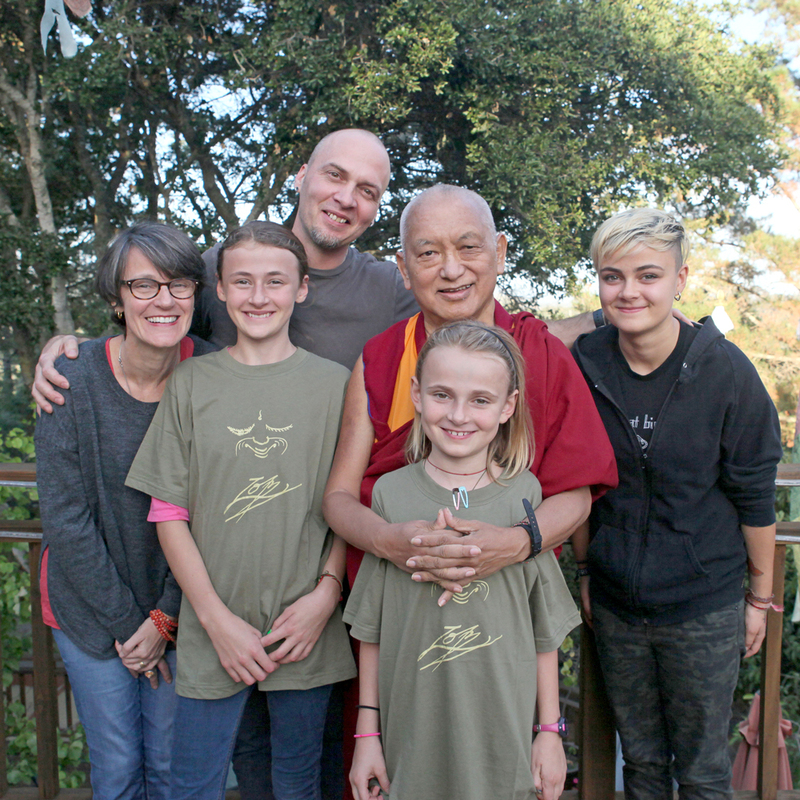 On the day the actual running began, there was a kickoff event up by the stupa on His Holiness’ birthday (July 6). I was happy to finally be running! So happy that tears went streaming down my face as I took the first steps away from everyone who had gathered to set the motivation for Miles of Merit. I ran 5 miles that day with my little sister, Maude, and one friend visiting from New York. The rest of the group walked the 8 Verses Trail, stopping to recite the verses, they cheered me on and gave me high fives each time I passed. The more I came to LMB and ran, the easier it became and the more I looked forward to it. Occasionally, people would join me on the run, which was really fun. I enjoyed having the company and it made some of the 108 laps go more quickly. One special visitor and running partner was my friend Desmond Koh, a former Singaporean Olympic swimmer. Desmond ran roughly 20 of the 108 laps with me. Desmond matched his pace with mine and gave many words of encouragement and advice for me about running. At one point it felt like I would never finish, and then when Desmond came, he helped get me get over that hump. Then, I felt like I would definitely be able to finish if I just kept going. It was a really amazing experience doing the run and made me soooo happy! Many people came to see me make my final lap around the 8 Verses Trail. It was a big day for me and I felt very accomplished and happy to have made the 108 laps. Over US$12,000 was raised from people all around the world! Having one idea and following through can make a big difference. 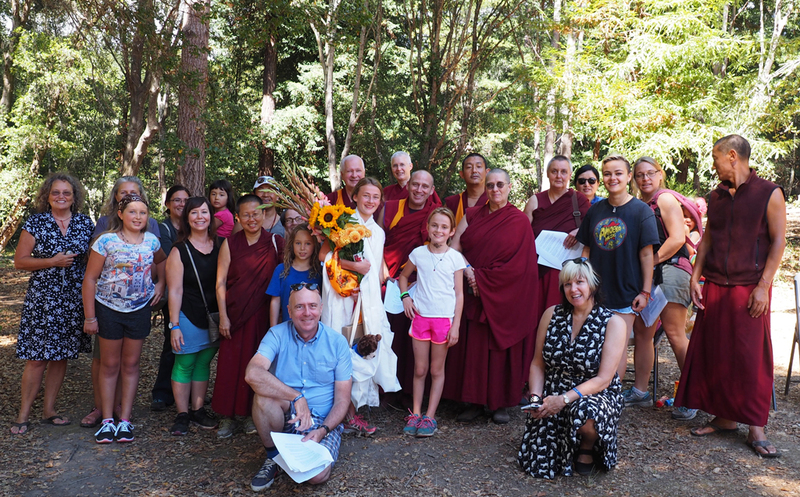 I would like to say a very big thanks to all the people that helped to make Miles of Merit a success, especially Lama Zopa Rinpoche, Ven. Tsomo, and Denice Macy. It wouldn’t have happened without all of you!!! Now I just wonder … what can I run for next? Hmm …. Learn more about Land of Medicine Buddha on their website.